With the start of the 17th century, Renaissance jewelry evolved gradually into a new style. From 1625 on, we see a clear reaction against the rigid and contorted dresses that had been worn by the ladies of the Renaissance. Soft, flowing dresses with low necklines became the gowns of preference and new jewelry was created to go with the new fashion. The above is mainly true for France, Italy and later Spain but due to the regional differences in Europe that were in place during the 17th century, the same can’t be automatically said for Germany, England, and the Netherlands. The second half of the 17th century was subject to religious conflicts which divided Europe and caused many Protestant craftsmen to flee their Catholic countries of birth and seek asylum in the protestant states like those of the Republic of the Netherlands. The French court became the new leading fashion trendsetter. During the Renaissance this role had been fulfilled by the Habsburg courts of Spain and Austria, bringing uniformity in court dress by diplomatic marriages and political influences. International trade flourished which allowed a middle class of merchants and craftsmen to rise and increase their wealth considerably. This allowed the bourgeoisie to start buying the kind of jewelry which, up until then, had been reserved for nobles. It is in the 17th century that retail jewelers emerge, distinct from the craftsman jeweler of the past. A Beautiful Example of Late Renaissance (or Early Baroque) Jewelry. An Antique Cameo, Surrounded by a Symmetrical Array of Diamonds, Rubies and Enameled Gold. The last years of the 16th century and the beginning of the 17th saw a gradual change of appearance in jewelry. The use of arabesque motifs, symmetry and a different type of gemstone setting caused these changes. Whether one would like to call this period late Renaissance or early Baroque is up to the reader; it was a natural evolution of styles which connected the two decorative periods. With the typical Renaissance mythical and devotional themes still firmly in place, the new styles gained slowly. Designs by men like Mignot and Lulls spread all over Europe and triggered the new wind that blew through jewelry design. From the end of the second decade of the 17th-century jewelry designs started to become more and more naturalistic. This tendency started in France but soon spread over Europe through printed designs. ‘Cosse-de-pois’ (pea pod) shapes and later flowers became very popular and over the 3rd and 4th decade many designs in this fashion were produced. Exotic flowers were immensely popular and botany became a study in its own right. The intensification of the trade with the near East had brought flowers to Europe which had never been seen before and a true craze for them was sparked. The Tulipomania of 1634 is an extraordinary example. 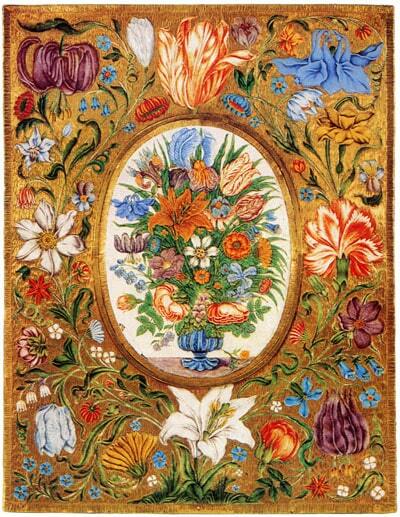 Flora, fashionable in embroidery since the end of the 16th century, was now adopted by jewelry designers as well. Painted enamel, champleve enamel and email on ronde bosse flowers were everywhere. From the 1650’s onward, engraving in metal was another, and later preferred, method of depicting flowers. 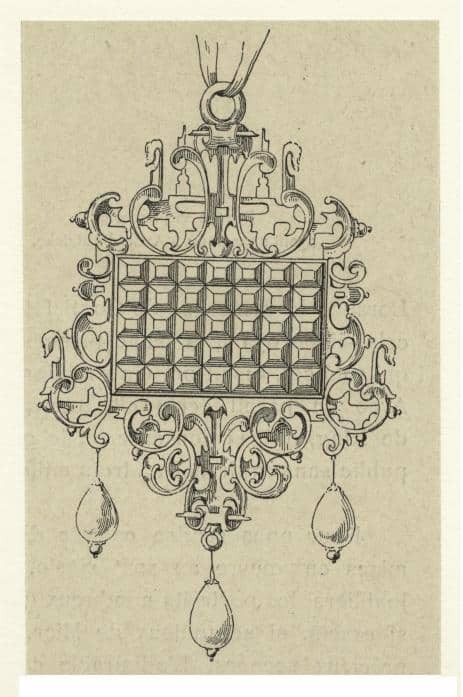 Pendant Design by Daniel Mignot, Late Renaissance. Figure work eventually fell from fashion and the emphasis on bright colors created with enamel slowly made room for the brilliance of gemstones on gold. The arabesque motifs were often engraved ‘en silhouette’ in metal or carried out in champleve enamel. The fashion for Moresque art came from Spain, where until 1492, an Islamic caliphate had been situated. The motifs were excellent ways to decorate large flat surfaces such as miniature cases as well as watch cases, which were a new appearance in the repertoire of jewelry items. Gemstone setting was now focused on highlighting and enhancing the gem, a result of the increased quality attained by improved cutting and foiling techniques. More advanced cutting designs also allowed for a much greater diversity of available shapes and jewelers began putting emphasis on displaying the stones themselves instead of just on the sculpted goldwork. On the right, we can see a pendant design by Daniel Mignot, early 17th century. Note the use of arabesque motifs, the architectural look created with the aligned diamonds and the perfect symmetry. Reverse of Mirror – Gold with Painted Enamel, 1670. 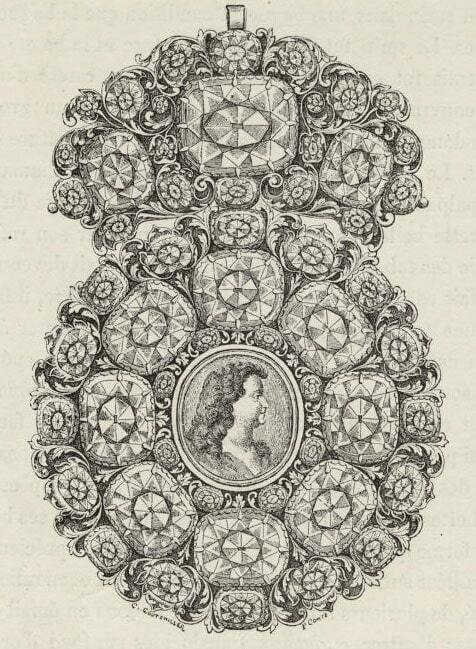 The second half of the 17th century saw the importance of faceted gemstones in designs increase even further. Gem mountings became more delicate and the designs moved away from cluster settings to naturalism and ribbon bows. 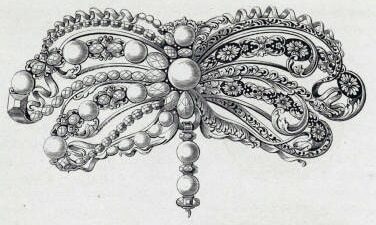 Bow Brooch Design, 17th Century. The bow is one of the most prevalent features of Baroque jewelry. Its origin is in the ribbon that was used to secure a jewel to a robe and turned into a popular motif itself. Made of precious metal and decorated with gemstones, pearls, and enamel, the bow brooch or pendant is seen on many portraits and designs. By the end of the 17th century, asymmetrical bouquets or individual flowers prevailed and the use of enamel diminished to the point that it was only to be found in the most conservative circles. A differentiation between jewelry meant to be worn during the day and jewelry that was enhanced by the soft glow of candle light emerged. This tendency developed further over the Georgian period. Although the Rococo style falls into the Georgian time span we will briefly address it here as well because it supplements the Late Baroque part of this section. 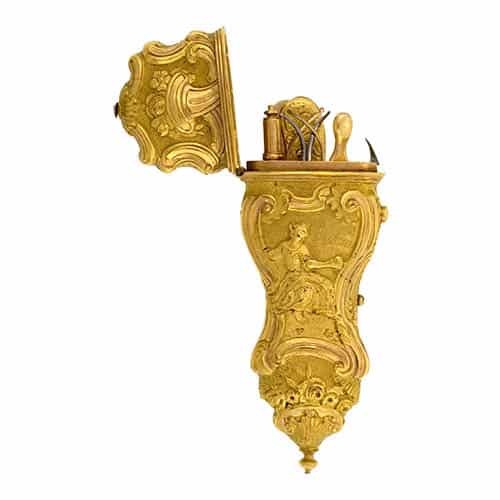 Starting in France around 1730, but spreading all over Europe in the years after, the Rococo style is marked by asymmetry of naturalistic designs. Flowers, foliate and feathers were embossed or engraved on metal. Enamel had completely been abandoned as a decorative technique in jewelry. 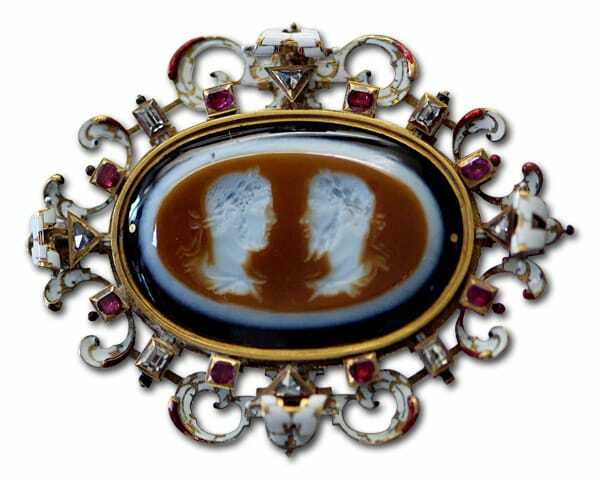 We find the Rococo style mainly in functional jewelry like chatelaines and snuff boxes. From portraits, it becomes clear that the new fashion in flowing dresses with low necklines was most commonly complemented by the wearing of sets of pearl jewelry. The Persian Gulf was the premier supplier of the extremely popular pearl in those days. A large pearl fishing industry in Persia (modern day Iran) was described by the famous French traveler and gem trader, Jean-Baptiste Tavernier in his autobiographic work, ‘The Six Voyages’. Imitation pearls were also produced as is illustrated by a patent by a Parisian gentleman called Jaquin which dates from the 17th century. Glass spheres would be lined with a mix of ground fish scales and varnish, after which the sphere would be filled with wax to provide strength. Diamonds were extremely popular as well during the Baroque period. Their availability had greatly increased as a result of intensified trading with India by the Portuguese, British and Dutch trading companies who reached the country by sea. An important diamond deposit was found in the early 17th century: that of Hyderabad in the Golconda region. Tavernier visited several diamond mining areas in India and his accounts tell us about the vast magnitude of the operations. 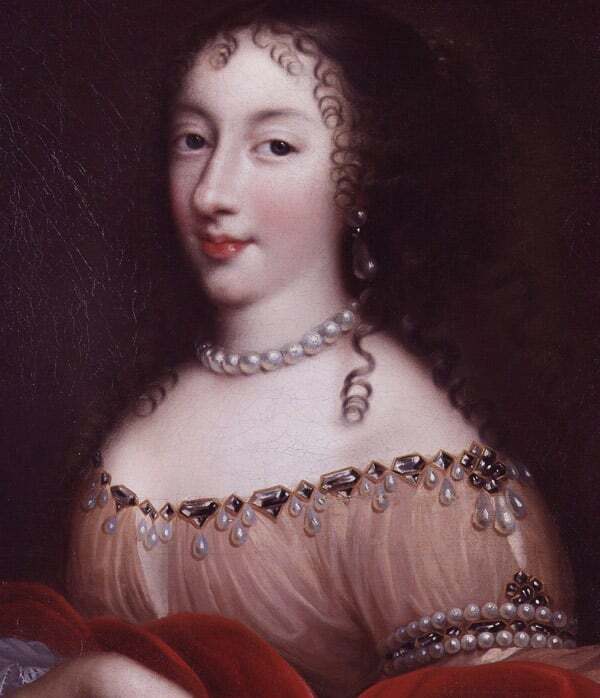 Henrietta Anne, Duchess of Orleans. Pearl and Diamond Parure. The term ‘brilliant’ started to be used to describe faceted diamonds. The Baroque Brilliants were predominantly square to cushion shaped, with short bezel facets, an open culet and rather steep pavilions and crowns. In order to enhance the idea of size, diamonds were now set in silver and foiled to enhance their sparkle at parties lit by candle light. Most diamonds from those days have been subjected to re-cutting into more modern shapes in order to increase their value. An unfortunate event as this has often meant that the jewel from which they were pulled was given a summary trip to the smelting crucible. Of the colored stones ruby, emerald and topaz were among the most prized species. High-quality imitation jewelry with strass (paste) was being produced on a large scale in order to meet the increased demand of the growing bourgeoisie. Enamel had retained its popularity for a very long time. From the Middle Ages all through the Renaissance and deep into the Baroque period, a continuous line in enameling can be observed. Jean Toutin from Blois, France managed to give a whole new impulse to painted enamel, creating wonderful miniature paintings of extremely high quality, a skill he passed on to his sons. 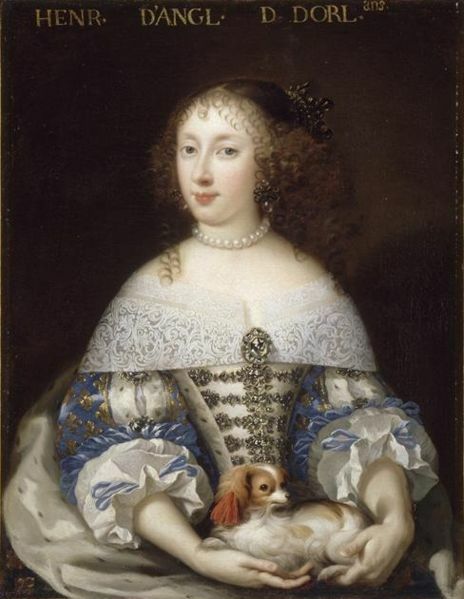 As mentioned previously, parures of pearl jewelry, often containing a short necklace, drop earrings, a string for the hair and dress clasps for the bodice, sleeves, and waist, are encountered in a great many of the portraits from the Baroque period. The earrings were often simple drop shaped pearls suspended from a golden earring but, by the 1650’s, more elaborate styles started to be worn. The most typical and well-known earring type from the late 17th century is the girandole, an earring which comprises a central piece from which three dangling ornaments are suspended. Men’s jewelry was most extravagant in France. This is most certainly reflected in the period during the reign of Louis XIV who, by the end of his life, had an enormous collection of jewelry and precious stones. Mainly due to the efforts of Cardinal Mazarin quite a few famous diamonds were present in this collection. In England, men’s jewelry was more restrained. It appears that continental fashion did not affect England much in the mid 17th century while it was under the Puritan rule of Oliver Cromwell. Royalist jewelry with miniature depictions of the executed king Charles I became popular among those who opposed puritanism. Spanish men wore the least jewelry of all, apart from some devotional or chivalric items, the wearing of jewelry was restricted by law. Princess Anne Henriette of England, Duchess of Orléans. A new development was the watch. In the 17th century it became an ornament by itself. During the Renaissance, clocks had been integrated into all kinds of existing ornaments but now the watch came into its own right. Just about every possible technique including gems on enameled fields, engraving, and embossing was unleashed to turn watch cases into the most astonishing jewelry items of their day.